In the post-Daubert era, forensic science disciplines are increasingly informed by robust, statistically-sound experimental research. The educational value of the well-documented case study, however, remains as important as ever. 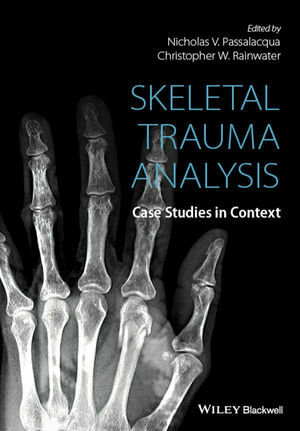 Emphasizing known contextual information, this volume serves as a case-driven guide to skeletal trauma analysis through the unique perspective of each chapter’s authors. Both forensic anthropologists and pathologists contribute skeletal trauma cases covering a range of topics including child abuse, blunt force trauma, descents from height, plane crashes, sharp force trauma and dismemberment, gunshot wounds, blast trauma, and burned body interpretation. Several chapters also include a discussion of potentially confounding taphonomic influences such as animal scavenging, water immersion, burning, and extended postmortem intervals. Detailed descriptions with multiple supporting images allow the practitioner’s skeletal trauma interpretation to be compared to the “answer” as it pertains to the known circumstances surrounding the traumatic events of each case. Nicholas V. Passalacqua received his Bachelor of Arts degree from Michigan State University, his Master of Science degree from Mercyhurst University, and a Master of Arts and PhD from Michigan State University. Nick works as a deploying anthropologist at the Joint POW/MIA Accounting Command - Central Identification Laboratory, actively engaging in the recovery and identification of U.S. servicemembers from past conflicts. Christopher W. Rainwater received his Bachelor of Arts degree from the University of Florida, his Master of Science degree from Mercyhurst University, and is currently a PhD candidate at New York University. Chris works as a forensic anthropologist for the Office of Chief Medical Examiner in New York City, actively engaging in anthropological casework in all five boroughs. He also serves as the Director of Photography for the agency.